The Chanute Blue Comets will try to avenge a regular-season loss when they go on the road to face the Fort Scott Tigers in the first round of the playoffs. Fort Scott topped its Southeast Kansas League foe 34-13 during Week 3. 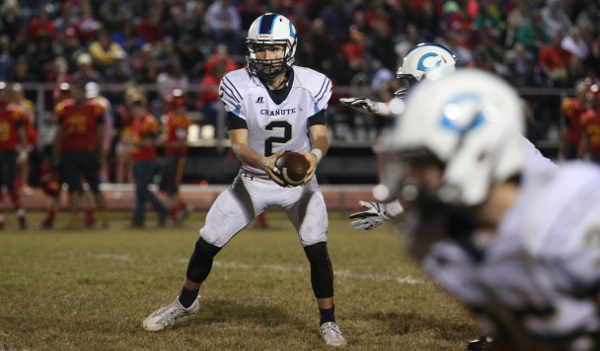 Chanute finished its district with a 2-1 record, earning wins over Coffeyville and Independence while falling 36-0 to district and SEK champion Labette County. The Blue Comets’ rushing attack is led by senior Jack Richard with about 500 yards. In the first meeting with Fort Scott, the Blue Comets’ rushing attack was limited 97 yards on 33 carries. Junior quarterback Corbett Kimberlin passed for 170 yards and a touchdown in the loss. Senior running back Zarek Fewell led Fort Scott with 301 rushing yards and three touchdowns on 22 carries. On the season, Fewell has led the Tigers with 1,587 yards and 26 touchdowns on 172 carries. Senior quarterback Jesse Jones has passed for 875 yards and eight touchdowns. As a team, the Tigers rush for 296.6 yards per game and pass for 108. Fort Scott enters the postseason on a four-game winning streak. The Tigers’ district victories included a 27-26 win over Paola. Last week, Fort Scott crushed Ottawa 71-34. This is a rematch of Week 1, a 33-21 McPherson victory at Buhler. Last year, Buhler defeated McPherson, 26-13, in the season opener. The teams are 3-3 against each other in the last six years and have been one of the state’s top back-and-forth rivalries in recent seasons. Five of the six matchups are within 16 points. Buhler, Maize South and McPherson, all preseason top-5 in the classification, went 1-1 against each other in early-season matchups. However, the Crusaders lost to rival Andale, 17-6, in Week 7 to earn the district runner-up. Buhler outgained Andale, 263-218, but finished minus-3 in turnover margin. McPherson has rolled since a 9-0 defeat to Maize South in Week 2, especially after a 38-14 home win versus Winfield in Week 3. Since then, the Bullpups are 6-0 and permitted just 19 points with three shutouts. Last year, McPherson was second in scoring defense in the classification behind Bishop Miege. This year, the Bullpups are second with just 63 points allowed, only behind Basehor-Linwood (56 points). Buhler has a total margin of 300-104, while McPherson has tallied 352 points, although against a much easier schedule. Buhler has reached at least the quarterfinals every year from ’08-16, including a state title in and a runner-up last season. The Crusaders last lost in the first round in 2005 with a 24-0 defeat to Pratt. Buhler has been one of the state’s most consistent playoff teams for all classes under 12th-year coach Steve Warner (115-28). The Crusaders averaged 33.5 points a game last year and 33.3 points a contest this season with senior running back Dalton Brown and a veteran line that features Braden Rose, Brendan Webb and Lawson Schultz. Ben Epp has completed 87 of 139 passes for 1,077 yards with a 9/7 TD/INT ratio. Brown has rushed 214 times for 1,412 times for 20 scores. McPherson limited him to 59 yards in the season opener. Since then, he has at least 97 in every game. One of the state’s leading performances came in Week 3, a 47-21 win against Wichita Collegiate, when he tallied 27 carries for 305 yards and four scores. McPherson held a 279-235 yardage edge in the first meeting with 260 passing yards. The Bullpups led the contest 19-0 at halftime. For the Bullpups, junior Kyler Hoppes has completed 111 of 171 passes for 1,510 yards with a 20/3 TD/INT ratio. Junior Jace Kinnamon has 135 carries for 865 yards and 14 scores. McPherson has averaged 182 passing yards a game and 5.5 yards per carry. The Bullpups averaged 8.6 yards per pass and 174 passing yards a contest. McPherson has 10 turnovers and stands at plus-5 in turnover margin. Seniors Jace Alexander (team-high 72 tackles, 13 TFLs) and Wyatt Siedl (Bullpup-best 14 TFLs) have led the defense. These are two physical teams who know each other very well. McPherson has the edge in the passing game, though Buhler has been able to move the ball against any team since the Week 1 loss. Brown has a tendency to have its biggest games in the biggest moments. He will need another one here if Buhler is to win on the road.